We look back on a particularly successful fifth edition of the PAS festival. Many of you visited various locations of Maastricht University for one or more of the 120 activities. Want to reminisce some more? Then check out our aftermovie. 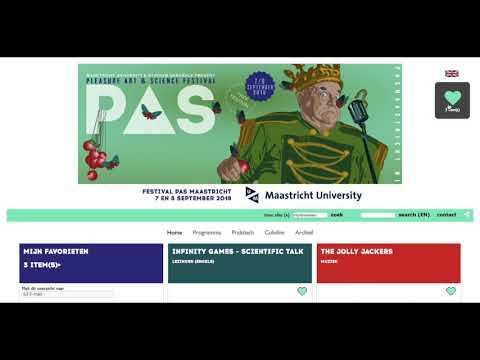 The PAS-festival provides an accessible introduction to the research that is carried out at the Maastricht University: Science. Another important branch is the fine arts, mainly in the form of music and theatre: Art. And all of this is seasoned with Pleasure, not only through a small programme of clownesque street theatre, but also because all the participants and visitors join in creating a wonderful atmosphere and enjoying a varied programme together. When? Friday 7 and Saturday 8 September 2018, from 7 pm till after midnight! The festival will be opened on Thursday 6 September with an opening lecture by Leo Bassi: Clowns: the art of losing or why being a fool is important in a neo-liberal society. Since there are limited places available, you have to make a reservation for this lecture. You can reserve your spot here. Following this lecture there will be a concert by urban Balkan band Project Rakija (no reservation required). The PAS festival programme booklets are out and the posters are slowly taking over the city. We thank Virginie Moerenhout and photographer Javier Fransisco Encinas for this iconic campaign image. All the lectures and activities at the PAS-festival will most of the time be spoken in English as well as in Dutch. In our programme booklet, released at the end of august, as well as this website, all English activities are described. We also have a Dutch website, with all the Dutch spoken activities. Click here to see all the photo's made by Joris Hilterman of the PAS-festival 2017.